Forged from the basics of good old-fashioned horsemanship and high tech innovation. Endurance riding, the sport of a million steps isn’t for the faint hearted. At the purest level or at the extremes of competitive distances, it is the ultimate challenge of horse and rider over the natural elements. 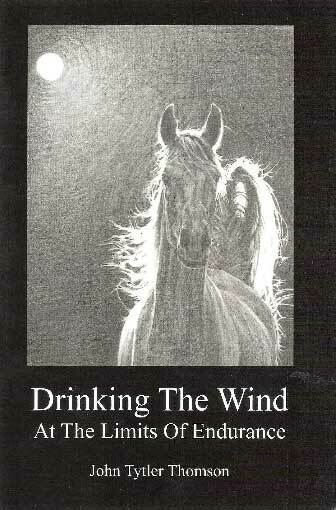 Drinking the Wind - is the extraordinary and inspiring version of one man’s recovery from a sudden and debilitating illness, an encounter with a ghostly horse and his progression to become a successful EGB endurance rider. This story is about courage, determination and the tough, intense, often unforgiving conditioning required to prepare a horse and rider for the extremes of endurance. This is a remarkable account of the formidable bond forged between the rider and his pure bred Arabian horse and their combined battle for the first Trans Scotland 200 miles Endurance Ride. Struck down by a sudden stroke, paralysed, brain damaged and emotionally wrecked the writer is hospitalised. During the initial days of recovery a second trauma occurs which places the writer in a near death experience. From what appears to be a passage through the void an encounter with a ghostly horse generates a massive life change and sets the writer on a whole new direction. The story tells the initial battle for recovery, investigation into the near death experience, the void and spirit guides. When the writer finally decides that the entire episode should be put behind him and to rest, he thinks that the final piece of the puzzle is to learn to ride a horse and be at oneness with the equine guide. The experience and this decision baffles friends and family and the subsequent recovery after months of intense, demanding, physiological and psychological testing astounds doctors. In the early chapters the writer examines the benefits of the American concept of Hippotherapy and therapeutic riding, challenges the theory that talent is natural and god given at birth and instead follows the demanding psychological concept of “deliberate practice” and the belief in extrinsic and intrinsic motivation. Within eighteen months, the writer, a person with little or no previous horse riding experience moves from an Endurance Great Britain novice to advanced class rider, comfortably winning various competitive classes along the way. Drinking the Wind – “His book about his 200 mile Trans Scotland ride is an entertaining read. It had me laughing and crying, holding my breath and sighing with relief as I felt I was riding along side him with every page. For me John can take his place alongside the likes of Bob Champion and Lance Armstrong. Men who when faced with life threatening illnesses have used their sport as a battle ground to fight back. Proving that they will not be beaten and “normal” life will continue.